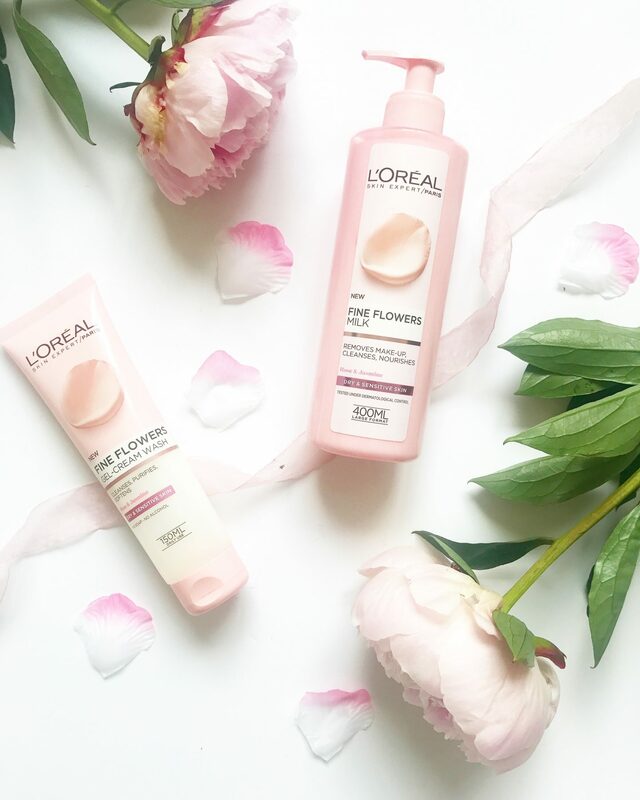 I recently picked up two products from the L’Oreal Fine Flowers range as I saw them whilst picking up some holiday bits and thought they looked and sounded really interesting. I have been using these products for a while now, every evening and so far I am loving them both, so thought I would do a review in case you have not heard of this range, or have been thinking about trying them! To remove my makeup, I used to use make up wipes every night, but I found these made my skin even dryer, and although they are convenient I switched to cleansers and creams. I have more recently been using the Garnier Micellar water, which has been great, but I wanted to give a cream based cleanser a go to see if it softens my face of an evening, due to dry skin problems! So this cleanser is £3.99, what a bargain and it’s 400ml so should hopefully last a while! L’Oreal claim ‘The creamy texture removes makeup, nourishes and envelops the skin in a veil of softness’. This is completely true! I am loving this so much, and I will be using this every evening now. It smells incredible, just really fresh and although it is creamy, it’s not too heavy or oily. If you have quite drive, sensitive skin then this is great for removing makeup and would highly recommend it! 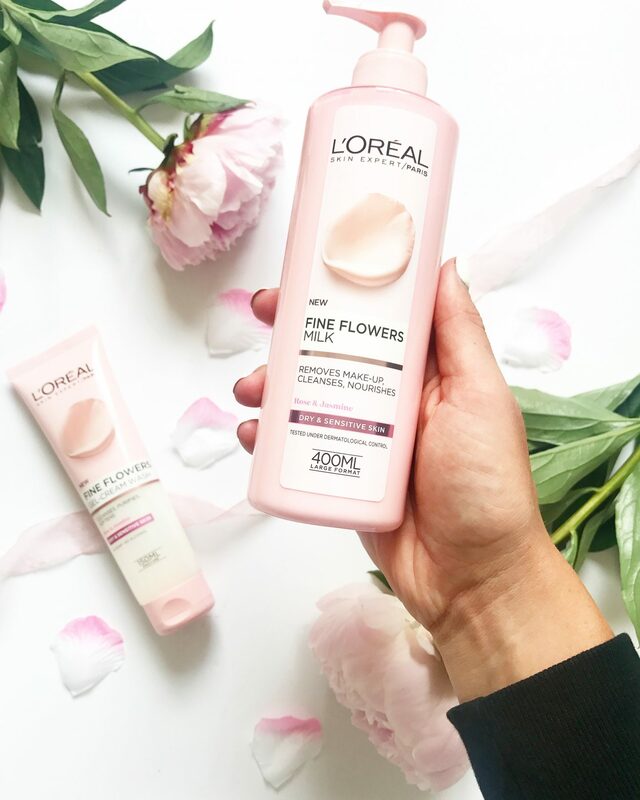 I also picked up the L’Oreal fine flowers gel cleansing wash and this only costs £1.99! I’m going to be honest, I’m not one of those who has an extensive night/morning skincare routine, so this cleansing wash is quite a new step for me. L’Oreal claim that ‘The rich gel-cream texture emulsifies in water, transforming into a creamy foam that cleanses and softens the skin without drying it out’. I feel it feels so silky and nourishing when you apply it to a cleansed face! It foams up really easily, but not too much and is can be easily massaged into the face. After a few minutes and the product is washed off, it leaves your face feeling really refreshed and clean. I wouldn’t say your face feels dry, but the only way to describe is it after you use a face mask and your face feels tight, that’s how it feels. Overall, I am really impressed with the two products from this range, and I will be looking at buying some more to test them out too! Have you tried this range before? What products do you use in your skincare routine? I’ve been wanting to try this range for ages but I have so much skincare to get through before investing! The packaging is so gorgeous and I absolutely love the smell of it, can’t wait to get my hands on it! I haven’t seen this range until now, but my god are the price points and claims tempting- always on the lookout for good skincare bits! I’ve really wanted to try this range and loved your review ? And can we just take a minute to appreciate your flat lay?!?!! Loving that!? I havent used this range before although they sound brilliant and the price is just a winner. I currently use an awful lot of temple spa products but they are a much heftier price than these!! Will definitely be checking them out! They’re both really good, I need to try more of the range! ? As we have matching dry skin problems and found these ok. I might pick them up next time I’m in Boots. Always helps to have pretty packaging too! Yesss they’re great for dry skin ? Ah thank you lovely ?? I wanna try these so bad! I wonder if they have them here in America. They look so cute and it sounds like they work great! They may do! They’re such a good range ?? I love the cleansing milk and toner from this range! I have the cleansing wash too but I just didn’t love it as much as the other two so haven’t used it as much. I can’t decide whether to try the cleansing Balm next too! Also how pretty is the packaging! The packaging is so lovely right ? ?